Across the United States, fans cheer on their home team every football season, with the hope that their team ends up in the big game at the end of the year. In North & South Carolina, the same motto applies, you just have 2 states coming together to cheer on their Carolina Panthers. 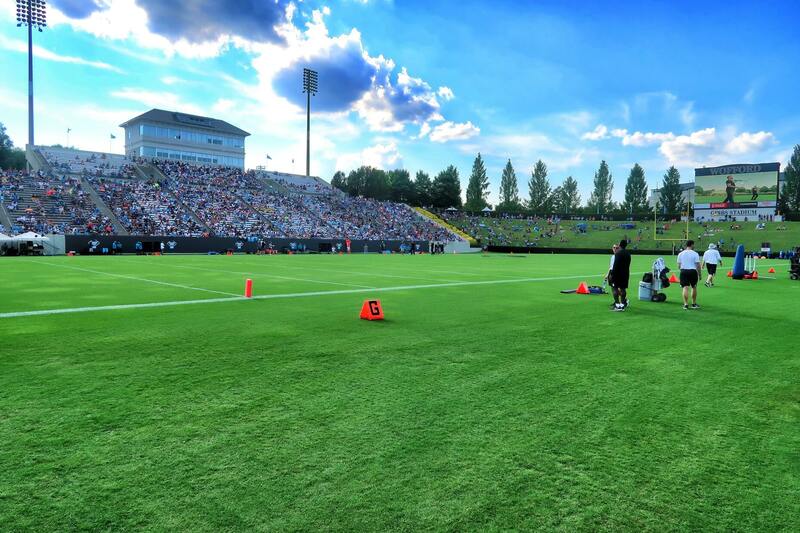 SC Travel Guide had the opportunity to join the team on opening day of the Carolina Panthers Training Camp 2018 at Wofford College in Spartanburg, SC. Come along on our adventure! We pull up and park at Wofford College and witness fans decked out in all of their Panther gear, this to include face paint on both kids and adults. 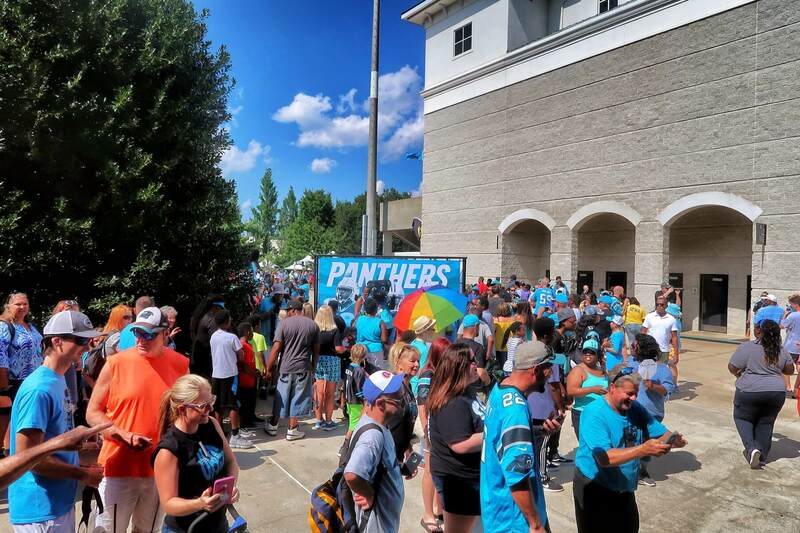 From outside the entrance, you could hear the Keep Pounding drum thumping, the Panther percussion line playing, and fans from all walks of life bonding with one common likeness, their team in Blue and Black. As you enter the common area of the stadium, there are multiple concessions, fans lines up to get their picture with Sir Purr on one side, and some of the Panther cheerleaders on the other. The opening day of training camp and all that surrounds it is where lifelong memories are made for some of the kids visiting for the first time. We then make our way to the media entrance to get out onto the field before the team comes out of the locker room. As we walk down towards the entrance of the field, the ‘Percussion drum line is on the field putting on a great show for the crowd, and the crowd loves it! 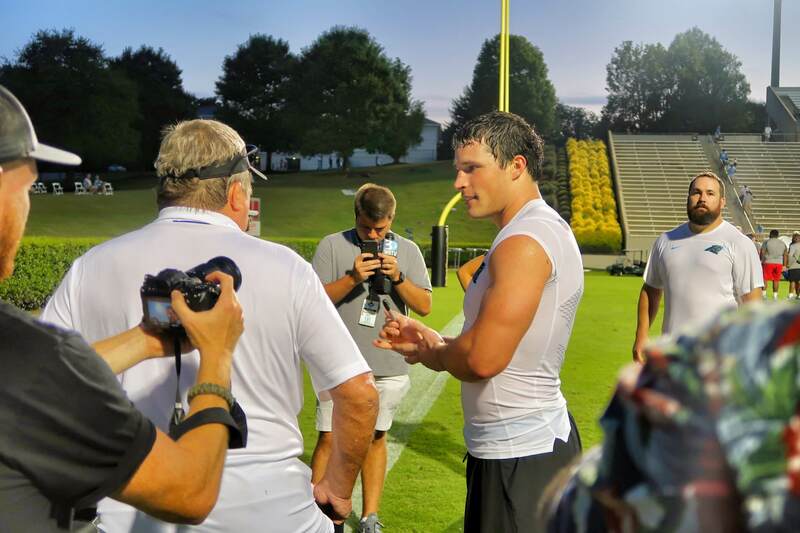 There is something truly magical about the atmosphere of training camp at Wofford College. It allows the fans to truly feel like they are seen and heard by their team as if everyone including the team is one big family. As the team begins to enter the field, the crowd begins to go crazy, everyone screaming a different name of their favorite player. Cam Newton was one of the last players to come out, and the crowd was never louder than that moment, finally seeing the leader of their team just feet away. Many family members of the players were seated on the visitor’s side of the field, and they were just as excited to see their family members play as the fans were. Many of them screaming for their loved one as if they were still out there on their old high school field. The mood was relaxed, excited, and confident for the 2018 season. Although we do not attend other NFL training camps, you would be hard pressed to find other NFL camps that display the camaraderie and love you will find in Spartanburg. The day was filled with a lot of stretching, warm up’s, and just getting used to being back on the field after what many feel is a long offseason. In addition to the fans being ecstatic to see their favorites, many were keeping a close eye on the new guys in town, and especially D.J. Moore. A few weeks prior to training camp, Panthers Alum Steve Smith went on record to say that he believes D.J. Moore would be the first player to replace him since he left. Moore looked very good on the first day of practice, gliding across the field catching the bullet passes from his newfound Allstar QB. 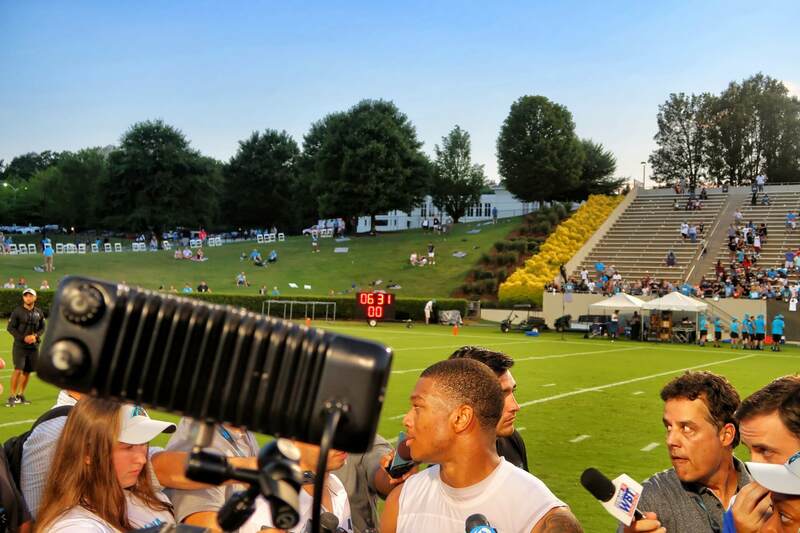 Moore got a crash course in media relations following the first day of Carolina Panthers Training Camp 2018. Many fans across the upstate of South Carolina have growing concern over the rumors that the team may move the camp away from Spartanburg. 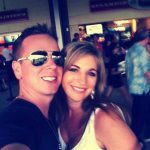 None of these rumors have been confirmed or denied, and nothing official has come directly from the Panthers organization. 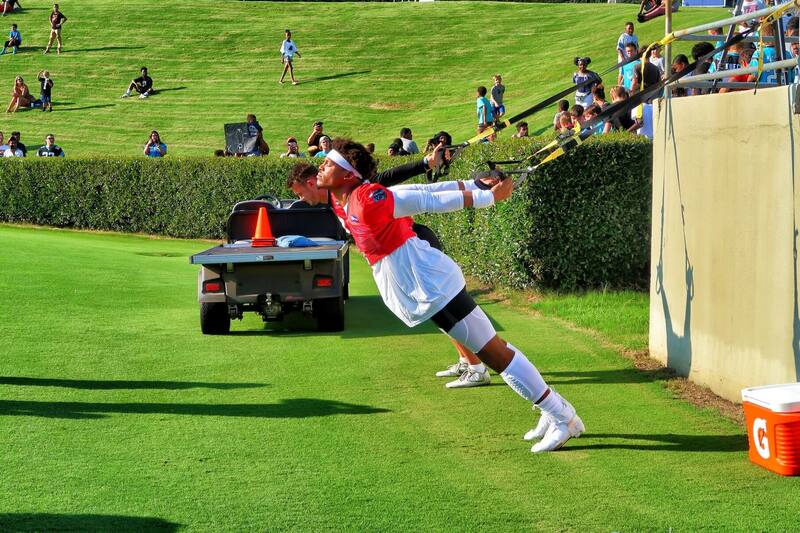 Will The Panthers Keep Training Camp In Spartanburg? A popular restaurant in Spartanburg called Wades had an aircraft flying over the field during camp with a banner in tow that read “Keep Camp In Spartanburg”. I believe this banner speaks for how most Panthers fans feal in South Carolina. As the first day of camp came to an end, it was time for the fans to get those autographs they have waited all year to get. The players made their way to the bleacher wall and signed hundreds of autographs and just hung out with the fans. 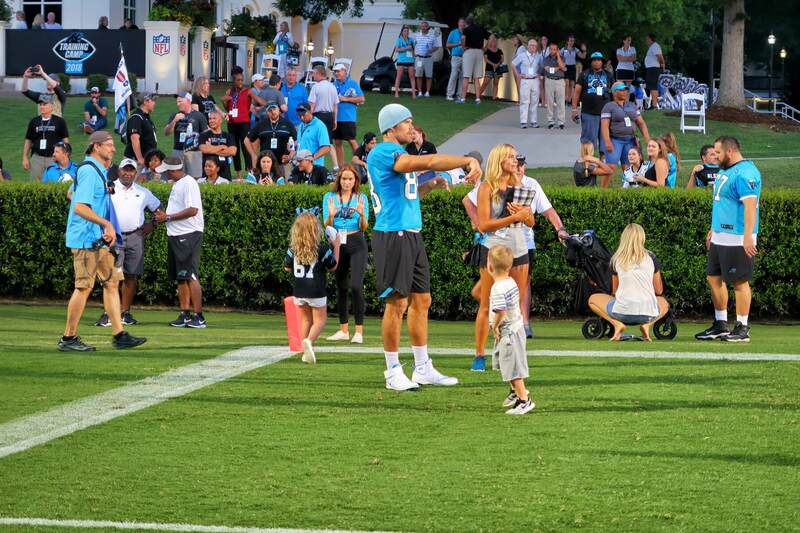 On the visitor’s side of the field, you would find Greg Olsen playing with his kids with his wife by his side. During our interviews with some of the players, I believe many of them were surprised by our non-traditional questions, such as, what did you do in the offseason? Did you go anywhere fun for vacation? You can catch a couple of our interviews in the video above. 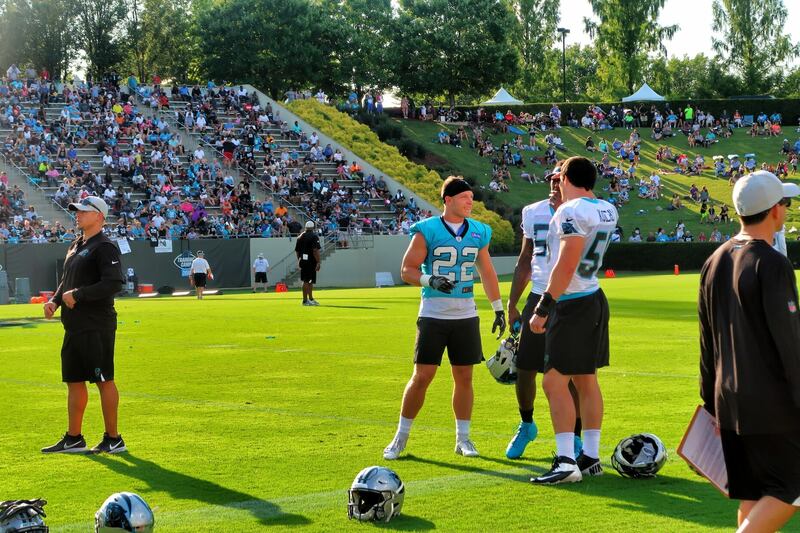 Our take away from Panthers Training Camp 2018 is simple, these are just normal guys, some more experienced, some less experienced, in both football and fatherhood. Some of the veterans that have split time between being a father, a husband, and a professional football player for many years will not only be a great role model as a veteran football player to the young guys, but also a role model of what its like to balance football and family. The rookies will learn not only football lessons from these guys but life lessons that they will take with them the rest of their life. The Carolina Panthers and their fans in both North Carolina and South Carolina have a great organization to support and be a part of. Our fans bleed the black and blue, win or lose, we will always support our team. KEEP POUNDING! Stay Tuned for more stories on the Carolina Panthers and all of our South Carolina Sports Teams. See the Carolina Panthers 2018 Schedule Below.